Today’s challenge, especially for many newcomers to the regulated industry, is not necessarily to gather regulatory information, but to know how to interpret and apply it. The ability to discern what is important from what is not, and to interpret regulatory documents correctly, provides a valuable competitive advantage to any newcomer or established professional in this field. An Overview of FDA Regulated Products: From Drugs and Medical Devices to Food and Tobacco provides a valuable summary of the key information to unveil the meaning of critical, and often complex, regulatory concepts. Concise and easy to read with practical explanations, key points, summaries and case studies, this book highlights the regulatory processes involved in bringing an FDA regulated product from research and development to approval and market. Although the primary focus will be on the US system, this book also features global perspectives where appropriate. 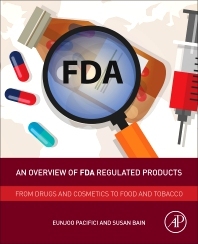 A valuable resource for students, professors and professionals, An Overview of FDA Regulated Products illustrates the most important elements and concepts so that the reader can focus on the critical issues and make the necessary connections to be successful. Dr. Pacifici is currently the primary course instructor and contributing faculty in a number of regulatory science subjects within The International Center for Regulatory Science (ICRS) at University of Southern California, working to provide the next generation of regulatory scientists with the knowledge, tools, and skills to expedite the development of innovative, safe, and effective biomedical products. She is deeply involved in guiding regulatory science doctoral students in their thesis projects exploring timely and probing policy and process questions in the area of developing and delivering safe and effective products to the patients. Her professional experience reaches beyond academia to include the biopharmaceutical industry where she worked in global product development and was involved in managing clinical studies and investigational sites, developing protocols and case report forms, training site personnel, and coordinating CRO and central laboratory activities. She has also led international product development teams in a cross-functional matrix organization with members from different functional areas located at sites across the globe collaborating to study investigational medical products. Recently, she was a member of a research team exploring the possibility of repurposing an approved drug for an alternative indication. Currently, she is leading the Regulatory Knowledge and Support function of Southern California Clinical and Translational Science Institute that is working to provide regulatory training, guidance and support, furthered by research into new approaches related to conducting clinical trials in diverse communities. Dr. Bain has a strong background in Regulatory Affairs, Quality Assurance, Compliance and Operations, with more than 25 years of managerial experience at leading pharmaceutical, biotech and medical device firms, as well as at the FDA. Her corporate experience includes serving as a Vice President in charge of Quality/Regulatory Assurance and Operations at the Huntington Beach-based SpineWorks LLC, a medical device company which focuses on implant design and development, assisting people with complex spine conditions. Prior to that, she was the Manager of Regulatory Affairs and then the Manager of Corporate Quality Assurance at Watson Pharmaceuticals in Corona, CA. She also held managerial positions in Quality Assurance and Control and/or Regulatory Affairs at Techniclone Corporation (Peregrine Pharmaceuticals), Baxter Health Care Corporation and Alpha Therapeutic Corporation (Grifols) in Los Angeles. As a FDA Consumer Safety Officer based in Irvine, she investigated complaints against FDA-regulated products, conducted audit recall checks and monitored compliance to injunctions and seizures. In addition, as a certified medical device investigator, she inspected various pharmaceutical, medical device, IVD and veterinary medicine firms for compliance to all regulations for product licensure and cGMP compliance.